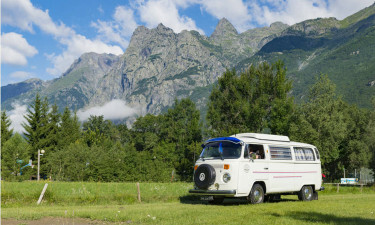 The breathtaking French Alps overlook this family-friendly luxury camping site nestled in the Romanche River valley in the Oisans region of southeastern France. Despite the towering surroundings, Le Belledonne is a sunny location. The first-rate accommodations are permanent structures, such as a mobile home. Beech hedges and mature trees offer natural and private settings between each holiday home. Nearby is the bustling market town of Bourg d’Oisans. Bourg d’Oisans serves as a staging ground for alpine cycling enthusiasts intent on challenging the legendary switchbacks bends of Alpe d’Huez. Indeed, the Tour de France frequently begins in this town. Give your family an alpine adventure of a lifetime by coming to Le Belledonne for your next camping holiday. Why should I consider luxury camping with my family at Le Belledonne next summer? Ecrins National Park. 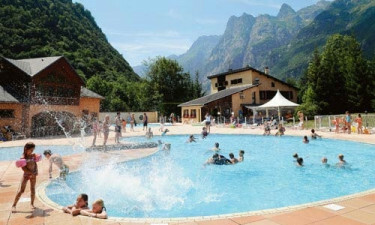 Le Belledonne holiday camping site lies at the foot of Ecrins National Park, the largest of the 10 national parks in France. The park has standardized routes for all fitness levels and is signposted throughout. Although it’s difficult to take your eyes off the soaring peaks, look down to discover some of the 1,800 different species of flora blooming along the footpaths. The great variety of wild flowers is the result of mirco climates created by rapid changes in altitude. Water sports. 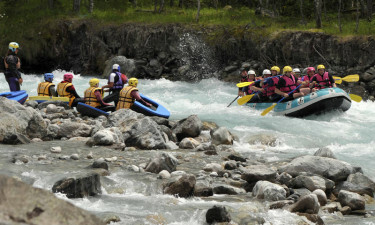 In addition to the onsite aquatic complex, nearby you will find glacial lakes, waterfalls, and rushing streams that provide opportunities for rafting, fresh water fishing, and other water sports. Whilst canoeing on a mirror lake, see if you can sight of the marmots, chamois, ibex mountain goats, and grouse that call this alpine paradise home. Chemin de Fer de la Mure is perfect for a family day trip. This little train takes visitors along a 30 km track of spectacular alpine scenery to the well-preserved surface and underground silver mine. The medieval settlement dates back to the 11th Century with the residents working the silver mine on behalf of the Dauphin. Furtermore the cable car network is a scenic alternative for travelling between mountain villages. Belledonne’s full-sized restaurant. A snack bar is available for those on the go or if you just need an in between treat. The terrace bar overlooks the aquatic complex. Le Belledonne has a full complement of sport facilities onsite, including an aquatic complex with a stunning alpine backdrop, sauna, tennis courts, children’s play area, and horseback riding a short 500 metres away. Bicycles are available for hire. There is a suitable terrain for every level of biking: mountains for serious cyclists, forested paths for families, and the flat campground for the little ones. LUX-camp ensures stress free camping luxury by having everything you need at hand. Le Belledonne has a well-stocked supermarket onsite that offers, amongst other necessary items, fresh bread and pastries.